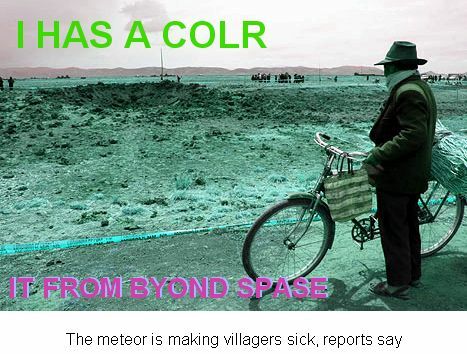 I realized shortly after submitting my two images that it was really called “The Colour Out of Space” and not “The Color From Beyond Space.” It does sound similar to “From Beyond” though. This is my favorite one on the site. It’s actually very eerie, not just funny or witty. Where did you get the picture of the villager with the bike? The source image is still available at the dailymail.co.uk link right below the picture. Turns out it was only arsenic, and not an Elder God. Rats. very funny, and clever too.